In Canada (71%), Spain (66%), and the United States (65%), more than six-in-ten respondents place themselves on the top rungs of the ladder (ratings of 7-10). Living in prosperous nations is no guarantee of satisfaction, however. Fewer than half in the relatively well-off countries of Italy (48%), Germany (48%), and Japan (43%) rate their lives high on this scale, though no more than 10% in any economically advanced nation rates their lives on the bottom rungs (ratings of 0-3). However, living in a less wealthy nation does not preclude a high level of personal satisfaction. 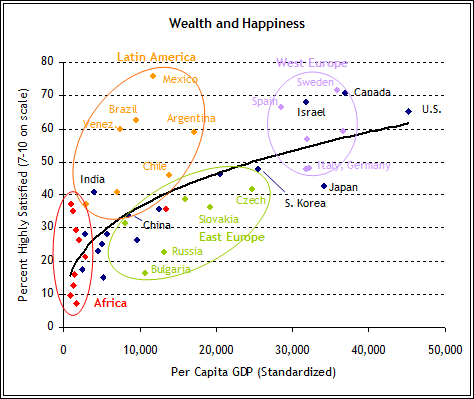 In particular, life satisfaction is quite high in several Latin America countries that have far lower per capita GDP levels than do most advanced nations. Indeed, Mexicans emerge as the most personally satisfied public in the survey – 76% rate their current life at least a seven. Brazilians (63%), Venezuelans (60%) and Argentines (59%) also tend to be satisfied with their lives, and fewer than 10% in any Latin American nation give their lives a low rating. In other regions however, fewer people rate their lives near the top of the ladder. In Eastern Europe, personal satisfaction is highest in the Czech Republic – one of the region’s wealthier countries – although even here, only 42% place themselves in the high category; this is a lower percentage than in any of the six Western European nations surveyed. Meanwhile, Russians are roughly as likely to rate their lives in the low category (21%) as the high category (23%), and in Bulgaria, those at the bottom of the ladder (30%) outnumber those at the top (17%) by nearly two-to-one. However, in Bulgaria, and throughout Eastern Europe, young people give their lives higher ratings than do older people. Bulgarians who are under age 30 have much more favorable views of their current lives (42% in the high category) than do 30-49 year-olds (17%), or those ages 50 and older (5%). Slovaks under age 30 are twice as likely as those ages 50 and older to be near the top of the ladder. Although generally less pronounced, the same pattern holds true throughout Western Europe as well. In the Middle East, fewer than three-in-ten Lebanese, Jordanians, Turks, Egyptians and Moroccans rate their lives a seven or better. Among Palestinians, the picture is even bleaker – 29% are in the lowest group and 24% are in the high category. Israelis stand apart from the rest of the region, with 68% in the top group. The lowest levels of life satisfaction are found in Africa. Just 10% of Tanzanians and 7% of Ugandans position themselves on the latter’s top rungs. Elsewhere the situation is less gloomy – 37% of Ethiopians are in the high category, along with 36% of South Africans and 35% of Nigerians. Overall, however, the African publics surveyed trail those in other regions. Over the last five years, the percentage of people in the top category for life satisfaction has grown significantly in 18 of the 35 countries for which comparative data are available. Gains have been especially dramatic in Latin America. In fact, the three countries with the largest improvements are from this region: Brazil, Mexico, and Argentina. Ukraine and India also have seen impressive gains, although in both countries the number of people at the top of the ladder is still less than a majority. Meanwhile, a few countries have experienced declines. In Italy, which has experienced stagnant economic growth in recent years, satisfaction levels have edged down by five points since 2002. The largest drop in self-reported quality of life occurs among Indonesians; five years ago, 32% gave their lives a high rating, compared with 23% today. Some of the greatest gains in personal satisfaction have occurred in nations experiencing sharp increases in economic growth since 2002. In particular, Argentina, Ukraine, and China stand out for their remarkable economic growth, and concurrent shift in positive ratings on the ladder of life. At the same time, Canada, Bolivia and Italy are notable for their meager GDP growth and low gains (in Italy’s case, a slight decline) in personal satisfaction. As with any linkage between broad economic statistics and personal evaluations, there are important exceptions. Russia has experienced 42% growth in per capita GDP over the past five years, but the share of Russians rating their lives in the top category has risen only slightly, from 18% in 2002 to 23% today. Similarly, despite substantial economic gains in percentage terms across much of sub-Saharan Africa, only in Ghana have quality of life evaluations improved substantially. At the other end of the spectrum, the greatest growth in personal contentment occurred in Brazil and Mexico, both of which experienced only modest GDP growth over the past five years. However, some publics express high levels of personal contentment, yet are relatively poor. This is quite common in Latin America. Other publics rate their lives not very highly, although they live in more affluent countries; the Japanese and South Koreans stand out in this regard. In most of the countries surveyed, majorities or pluralities say they are at a higher spot on the ladder of life than they were five years ago. And this is true even in many countries where overall assessments of life remain relatively grim. For example, very few Kenyans or Ugandans place themselves in the top rungs on the ladder of life; nevertheless, 55% of Kenyans and 54% of Ugandans rate their current lives more highly than their lives of five years ago. Many people in other regions also believe their lives have gotten better over the last five years. More than half of Kuwaitis (56%) say they have made progress. In Peru, 52% are at a higher spot on the ladder now, and in neighboring Argentina, 48% have made progress, a striking change from 2002, when only 19% of Argentines felt they had made progress over the prior five-year period. 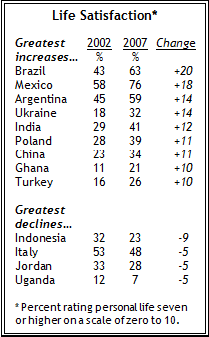 Nonetheless, as is the case in many countries, about as many Argentines say they have either lost ground (28%) or stayed the same (23%) over the past five years, as say they are better off. And perceptions of progress are not prevalent everywhere. In Italy and Bulgaria, pluralities say they are at a lower spot on the ladder today than they were five years ago. And in the heart of the Middle East, people are even more likely to feel they have lost ground – 58% of Lebanese, 57% of Palestinians, and 42% of Jordanians say they currently occupy a lower rung on the ladder of life than five years ago. Of all the measures of personal satisfaction, the shift in how people rate their own progress over the last five years is the most strongly correlated with real per capita GDP growth since 2002 (.55 correlation). Accordingly, several countries that have seen strong economic growth, such as Argentina, Venezuela, Slovakia, Bulgaria and China, also tend to have enjoyed large gains in personal progress. Regardless of how they feel about their current situation, publics throughout the world generally are inclined to believe their personal lives will improve over the next five years. In nearly every country surveyed, majorities or pluralities expect to be at a higher point on the ladder of life five years from now. Despite the many challenges faced by countries throughout sub-Saharan Africa, the region stands out as the most optimistic in the world. Roughly nine-in-ten respondents in Mali, Ivory Coast and Senegal believe their lives will improve, as do large majorities in six of the other seven African nations included in the survey. Optimism also characterizes most Asian countries, including the growing economic giants, India and China. Eight-in-ten Indians and 76% of Chinese believe their lives will get better in the coming five years. Most Latin Americans also are optimistic; at least half of those in the seven Latin American countries surveyed say their lives will improve. Brazilians are particularly hopeful, with 71% saying they expect their lives to be better in five years and only 7% giving their future lives a lower rating. The picture is a bit more mixed in the Middle East. Moroccans, Kuwaitis, and Israelis are generally hopeful about the future. Elsewhere in the region, optimism is not as strong, although optimists consistently outnumber pessimists even in places that have experienced conflict in recent years, such as Lebanon and the Palestinian territories. In the West there is a bit less optimism about the future. The United States is the most optimistic Western country; still, only 55% of Americans anticipate being better off in five years. The British (50% optimistic) and Swedes (48%) are the most optimistic in Western Europe. In Eastern Europe, about half of Slovaks, Ukrainians, Poles, and Russians feel hopeful. Czechs, however, are the gloomiest public surveyed; just 32% believe they will make progress over the next five years and more than one-in-four (28%) think they will actually lose ground. While most people envision their own lives improving over the next few years, they are less optimistic about the long-term prospects for their countries’ children. Majorities in only 18 of 47 countries think their nations’ children will have better lives when they grow up than people have now. Pessimism about the prospects for the current generation of children is especially prevalent in Western Europe, the United States, and Canada. People in France, Germany, and Italy are the most glum; even in the United States, usually considered a fairly optimistic country, only 31% believe things will be better for American children, down from 41% in 2002. In nine countries, including nearly all advanced economies, majorities see tougher times for today��s kids. There also is little optimism in Latin America or the Middle East, although some countries stand out for their positive view, such as Morocco (67% better) and Chile (62%). Eastern Europeans tend to be more hopeful, particularly Slovaks, 68% of whom believe life will be better for their country’s children. But optimism is strongest in Africa and Asia. At least six-in-ten people in Ivory Coast, Nigeria, Senegal, and Ethiopia believe life will be better for their children. The highest levels of optimism, however, are in China and Bangladesh. Fully 86% of Chinese believe things will be better for their children and 84% of Bangladeshis say the same. This hopefulness is not shared by all Asian countries though; 70% of Japanese say that when their country’s children grow up, they will be worse off than people today. In nearly every country surveyed, people are more satisfied with their family lives than with their incomes or jobs. Majorities in every country except Uganda and Tanzania are satisfied with their family lives, and in 28 of 47 countries 80% or more say they are happy with their family lives. People are less enthusiastic about their jobs; still, in 38 countries, majorities of those who are employed say they are satisfied. Job satisfaction is highest in Canada, Sweden, the Czech Republic and the United States, and is generally lower in Africa. 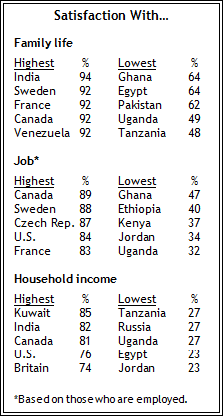 In most countries, people tend to be less satisfied with their household incomes than with their families and jobs. Nonetheless, majorities in 29 countries say they are satisfied with their incomes. In India, which has experienced strong economic growth in recent years, 82% are satisfied with their household income. But the highest level of contentment is in Kuwait, where 85% are satisfied. The percentage of people who are satisfied with their income is up significantly in 19 of 35 countries where trends from 2002 are available. 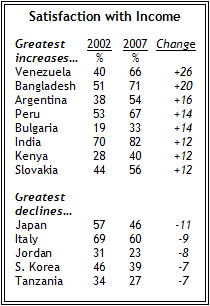 Several Latin American countries have shown substantial gains in positive views of household income. This is especially the case in Venezuela (+26 points), Argentina (+16) and Peru (+14). The Japanese have experienced the largest decline in income satisfaction; nearly six-in-ten (57%) felt good about their income in 2002, but today less than half (46%) are satisfied. Outside of Western Europe, Canada, and the United States, many respondents struggle to afford life’s basic necessities. And even in the West, significant minorities say that in the last year they have been unable to afford food, health care, or clothing.4 About one-quarter (23%) of Americans report lacking enough money for health care that their family needed at some point in the last year, while 16% were unable to afford food and clothing. Some of the most distressing results can be found in Africa. Two-thirds of Ugandans (66%) have been unable to buy food within the last year and 76% unable to afford health care. About six-in-ten Kenyans have lacked enough money for food, health care, and clothing their family needed. Many in Tanzania, South Africa, and Ghana also report being deprived of these basic needs. Deprivation is all too common in Latin America as well, especially Peru and Bolivia. Two-thirds of Peruvians have been unable to afford necessary health care within the last year. Elsewhere in the region, there is less deprivation, although many people still struggle. In Mexico, just under half say they have lacked sufficient money for health care and clothing. Nearly half of Ukrainians also say they have been unable to provide health care or clothing. And in neighboring Bulgaria and Poland, roughly one-third have been unable to afford food, and even more have lacked money for health care and clothes. Deprivation is much less common among Slovaks and Czechs. The situation is mixed in Asia. Deprivation levels are relatively high in Bangladesh, Indonesia, and Pakistan. The Chinese are generally better off, although one-third say there has been a time in the last year when they could not afford health care needed by a member of their family. Fewer than 10% report going without food, health care, or clothing in Malaysia, and even fewer report lacking resources for these items in Japan. Indeed, deprivation levels in Japan are lower than in any other country included in the study. There are substantial differences in reported deprivations among predominantly Muslim countries in the Middle East. Roughly half of Turks (48%) say there have been times in the past year they have lacked money for food, and comparable numbers report being unable to afford health care (47%) and clothing (50%). Deprivations also are fairly common in the Palestinian territories and Morocco. But levels of deprivation in Kuwait are as low as in many advanced countries, and lower than in the United States. While deprivation remains troublingly high in many countries, there have nonetheless been many significant improvements since 2002. In 20 of 35 countries for which trends are available, significantly fewer people than in 2002 say they have been unable to afford food for their families within the last year. In 22 countries, there has been a decline in the proportion of people saying they have not been able to afford health care; in 24 nations, fewer say they have lacked money for clothing. In several countries these improvements have been particularly dramatic. Overall, Jordan has experienced the greatest gains of any surveyed: the percentage of Jordanians who have been unable to afford food has dropped 30 percentage points since 2002; the percentage unable to provide health care has fallen 23 points; and there has been a 20-point drop in the share of Jordanians unable to buy clothes their family needed. Major changes also are found in other regions of the world. In West Africa, significantly fewer Ghanaians now struggle to afford food, health care, and clothing compared with five years ago. In Eastern Europe, fewer Russians, Ukrainians and Bulgarians now report being unable to afford these items. Deprivation also is less common in Latin America, especially among Argentines and Venezuelans. In countries throughout the world, people tend to name financial concerns as the most important problem in their lives. When asked to describe in their own words the most pressing problem facing them and their families, majorities or pluralities in 46 of 47 countries mention economic concerns, such as unemployment, low wages, or the high cost of living. Financial concerns are particularly widespread in Africa; more than eight-in-ten respondents in Ivory Coast, Senegal, Ghana, Tanzania, Ethiopia, and Mali volunteer financial concerns as their most important personal problem. But sizable numbers in Asia, the Middle East, Eastern Europe, and Latin America also name economic challenges. People in the advanced economies of Western Europe, the United States, and Canada tend to voice a wider array of concerns; still, personal financial issues tend to predominate, especially in Italy, which has experienced little economic growth in recent years, and Spain, where the economy has improved but relatively slowly. Economic expansion does not necessarily eliminate concerns about personal finances, however. Countries such as Ukraine, Poland, Turkey, and Venezuela all have enjoyed substantial economic growth in recent years; nonetheless, financial concerns remain high in each of these countries. Although economic issues trump other concerns in nearly every country, respondents also describe a number of challenges in their personal and family lives. For example, in South Africa, which has one of the world’s highest crime rates, 21% name crime as their chief concern. In the Palestinian territories, where checkpoints and other barriers make transportation difficult, 17% say transportation problems are their top worry. Aside from financial problems, the second most commonly mentioned problem is health and health care, including issues such as personal illness, health care costs, poor quality health care, drug and alcohol use, and hunger. Respondents in relatively prosperous nations are especially likely to mention health and health care issues as their top worry. Germany is the only country where health concerns (28%) outweigh finances (22%), although more than one-in-five Swedes, Japanese, and Canadians also mention health. In the United States, 19% name health issues as their top personal concerns.